I am nearing Yazd. The landscape is stunning. Towering, barren, sedimentary mountains streaked with iron oxides flank both sides of the road. It has been a long day, driving through hundreds of miles of arid wilderness. As I wind my way through the burgeoning city, millions of street lights twinkle in the darkness in warm welcome. 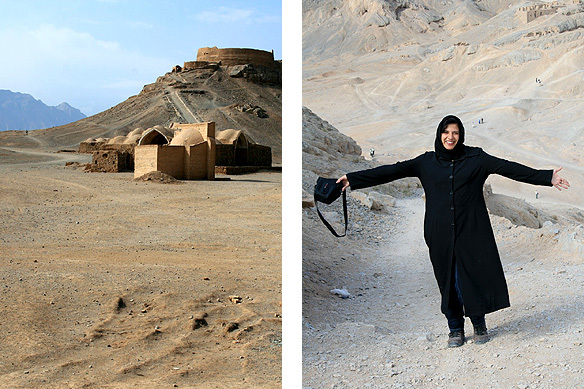 Yazd is one of those not-to-be missed, no-matter-what, highlights of Iran. Wedged between two desolate deserts, it has long been a prosperous staging post on the caravan route between Esfahan and Central Asia. 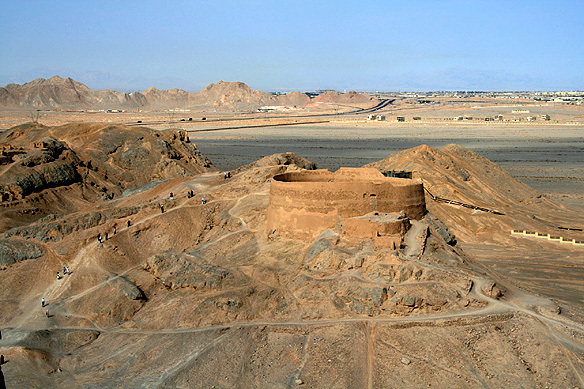 The city was an important center for Iran’s pre-Islamic religion, Zoroastrianism, and still has the largest Zoroastrian population in the country at 12,000. So it is befitting that my day starts with a visit to the Towers of Silence perched atop parched hilltops in its outskirts. Till recently these towers were used as putrefaction plateaus where corpses were picked clean by vultures. A priest would sit with the bodies which were placed in a seated position, and watch to see which eye the vultures picked out first. If it was the right eye, the soul faced a promising future. However, if it was the left eye, it symbolized a pretty grim afterlife. 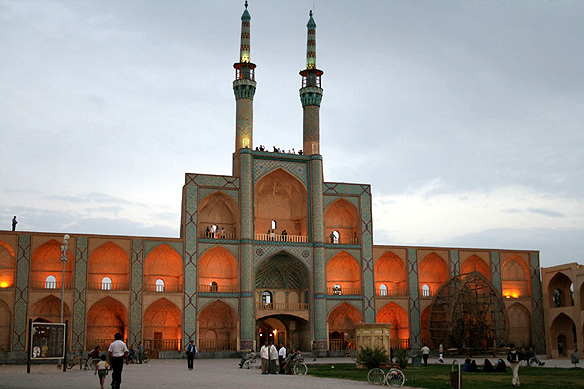 Such towers were used in Iran up until the Islamic Revolution in 1979. The Ateshkadeh (Zoroastrian fire temple) in the new city attracts followers from all over the world. Its sacred flame has apparently burned since 470 AD and was transferred to the current temple in 1940. At the Towers of Silence; it is a long walk to the top. 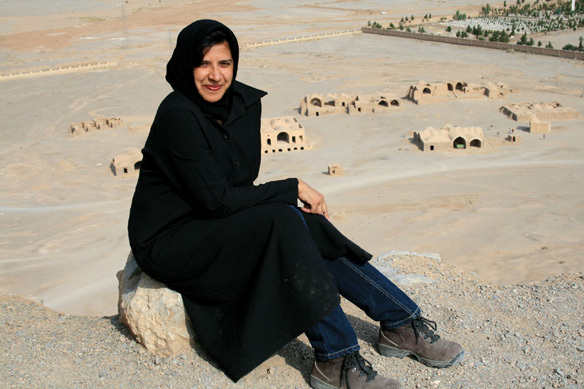 It is love at first sight for the old city of Yazd and me. According to UNESCO, the old city is one of the earliest inhabited towns in the world. The whole precinct is made up of sun-dried mud bricks. The resulting brown skyline is dotted with tall badgirs or wind towers. The nearby mountains provide water through a series of qanats (deep underground water channels). There is only one way to see the old city. And that is to get lost in it, wandering aimlessly through the brown tangled lanes. “My birthday on 2nd April. You send me e-mail?” “This my phone number. Call me?” And I find scraps of paper with addresses and numbers scrawled on them shoved into my hands with a smile by complete strangers. “You from where? Iran good?” And this is followed with the kindly face asking me to open my palms and placing in them the snack they had been munching on. It would be sheer rudeness to decline. So one smiles and eats together with them. Little boys pass me by on their tricycles waving happily whilst young girls pose for my camera amidst peals of laughter. 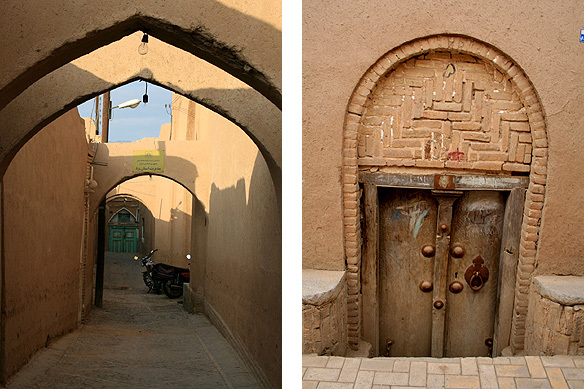 Yazd is a photographer’s delight. 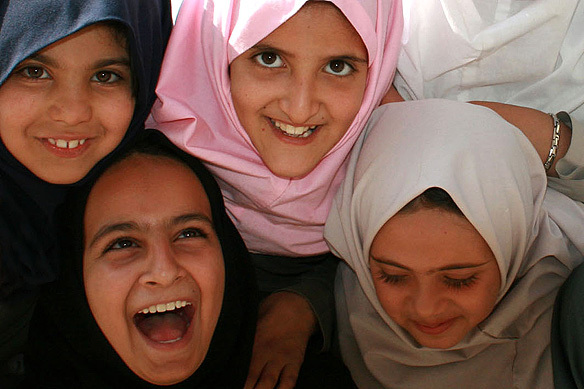 Though what makes it more special is, like everywhere else in Iran, the love and warmth of its people. Old Yazd has dozens of mosques but the most magnificent of all is the 14th Century Jameh mosque, which it holds tenderly in its folds. Its 48-meter-high minarets dominate the old city’s skyline and the elaborately tiled entrance portal is among the tallest in the country. 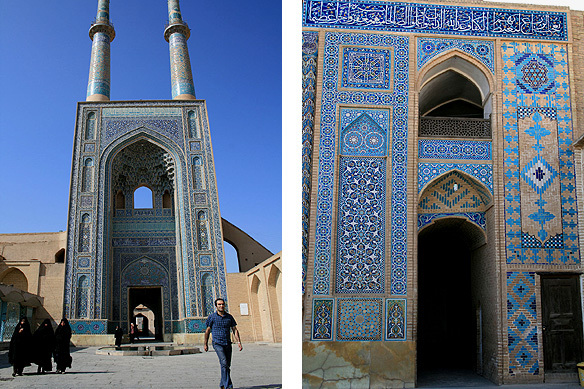 The beautiful blue mosaics covering the dome, inner walls and mehrab are simply astounding. It is Friday and noon time. The women carry out their namaaz, completely immune to the world around them, wrapped in their chadors, whispering verses from the Koran. As the sun sets, I find my way to the Amir Chakhmaq Complex with its three-storey takieh where the death of Imam Hossein is commemorated in bloody enactments every year. The Saheb Zaman Zurkhaneh by the square is a great place to see a traditional gym in action, replete with huge bowling pin-style weights being waved around. This “exercising” is accompanied with drumbeats, Hafez’s poetry, and endless cups of chai for the audience. What a perfect way to spend the evening indeed. Unfortunately, being Friday, all the athletes are on holiday. Oh well, option no. 2. I sit in the lawns facing the takieh, gazing at the 700-year-old edifice and timeless ambiance, while the traffic hums behind me and the moon and stars peep out from the heavens and smile. At times Option No. 2’s work better than their first counterparts. and the dazzling medieval Jameh mosque in its folds. The 14th Century Amir Chakhmaq complex at sunset—another beautiful day ends. 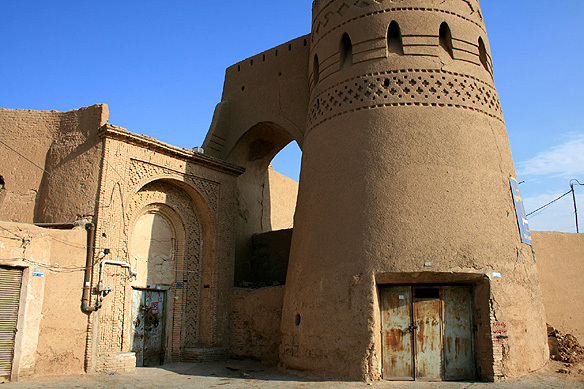 This entry was posted in Exploring our World, Iran and tagged Amir Chakhmaq Complex, Ateshkadeh, Hafez, Iran, Jameh Mosque, Things to see in Iran, Towers of Silence, UNESCO World Heritage Site, Yazd, Zoroastrianism by Rama Arya. Bookmark the permalink. Your words are woven well enough to take me on a journey of my own through the intriguing streets of Yazd. Thank you for sharing your experiences with us! My pleasure. 🙂 Thank you for stopping by. I hope you get to experience Iran first-hand some day. The blue shade is so very Iran! I have seen this shade in hand-painted artwork and display pieces. 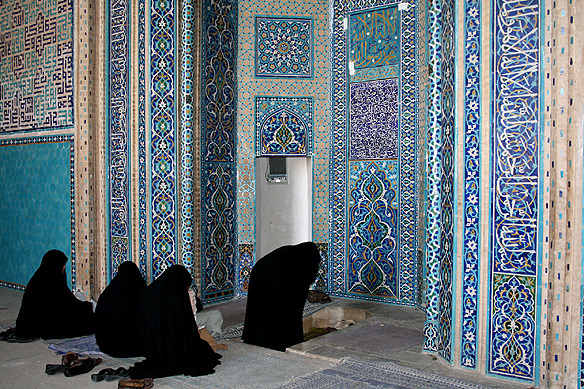 Even tile work from ancient Iran features these beautiful blue shades. Yup, it is a lovely blue. 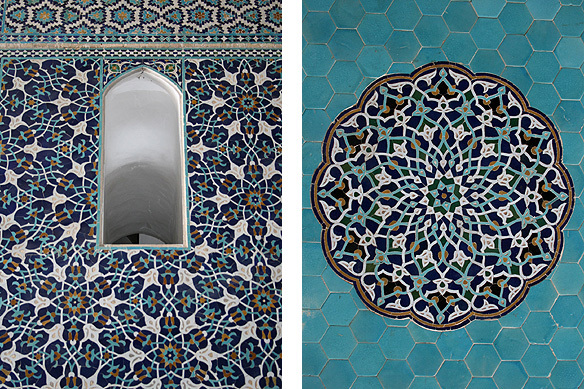 Iran’s tile-work is exceptionally stunning. Better than most that I came across in other Middle Eastern countries. What is also commendable is the consistency in quality–it is of superior quality throughout the country, whether it be in big metropolises or small towns. Thank you vaaaaanix, with the 5 a’s in the name. 🙂 Had to count the number of a’s in your name to make sure I got it right. Glad you enjoyed the post.